When all the Noroton Heights Railroad Station concrete platforms are replaced starting next spring, the state Department of Transportation won’t be expanding the platform, a department official said Wednesday at a meeting in Town Hall. 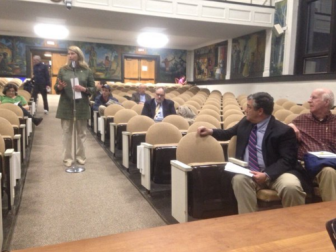 First Selectman Jayme Stevenson speaks at the Connecticut Commuter Rail Council meeting held Wednesday in Darien Town Hall (photo from the council’s Twitter feed). A project to replace the concrete “Double T” platforms that are crumbling at the station will be undertaken in segments until all of them are replaced, the department has already announced. At a meeting of the Connecticut Commuter Rail Council held in Darien Town Hall on Wednesday, council members asked John Bernick, assistant rail administrator for the department, whether or not the station could get the platform lengthened, since future trains may have as many as 12 cars. Right now, the north platform has 10 segments and the south platform has nine, Bernick said. Council members asked First Selectman Jayme Stevenson whether or not she’d prefer a longer platform, and Stevenson said that in talks with ConnDOT, she’d told the state she would want to maximize the number of platforms, ideally to 12 on each side. But Bernick said the platform replacement project “was designed to address the immediate need” of replacing the concrete platforms. “It’s long past due to get them swapped out,” he said. The platforms have deteriorated so much that “Noroton Heights is by far the worst along the [New Haven] Line,” he said. Stevenson said she’s prepared to propose a new station building that the town would partly pay for, in conjunction with state, federal and private funding sources, and the town wants to replace or upgrade the “walkover” bridge above the tracks, possibly supplementing it with a second bridge. Reconstructing the train station facilities would be done in co-ordination with redevelopment of the Noroton Heights business district, where the two major property owners — the Palmer family and Federal Realty — have proposed separate plans for mixed-use buildings incorporating new housing, stores and offices. The commercial redevelopment of the two blocks immediately north of the train station, along Heights Road “would be, without a doubt, the largest single redevelopment in the history of Darien,” Stevenson told the council and state transportation officials at the meeting. Replacement of the platforms is scheduled to start in the spring of 2017 and continue in stages through the end of 2018, with some parking near the platforms temporarily removed in order to have room for equipment and the work. “Many of the existing platform sections and access structures located at the Noroton Hegihts Railroad Station are in poor condition, non-ADA [Americans with Disabilities Act] compliant and require replacement. “All guardrails, handrails, recycling centers and existing shelter on the eastbound platform will be removed and replaced. Existing lighting, signage, benches and all other platform appurtenances will be removed and reinstalled. “Lighting will be upgraded to be LED. Major construction tasks will be performed during night and weekend closures. During select weekends, access to the station building and sections of the surface parking lots will be restricted. Bernick and other Transportation Department officials discussed the project to reconstruct the Atlantic Street underpass of the New Haven Line in Stamford. That work is expected to start sometime this spring and continue through the fall of 2019. At some point, the New Haven Line will be restricted to two lines going over the bridge. Department officials said they will make every effort to minimize any restrictions on train service while he other two lines are closed. During Phase 1 of the project (from spring 2016 to Summer 2018), ;the Exit 8 off ramp will be reconfigured, with a new ramp bridge over Atlantic Street and utility lines under Atlantic Street moved in order for the roadway to be lowered. In Phase 2 (from spring 2017 to fall 2019), the railroad bridge will be replaced, the street will be lowered and the platform for Track 7 will be replaced. That will result in Atlantic Street being closed at the bridge for two months and ongoing temporary lane closures, with detour routes on weekends, according to an information sheet distributed at the meeting. Nighttime highway work is already closing lanes on Interstate 95 at various spots between Greenwich and Westport, and for the week starting Monday, Dec. 5 more is on the way for daytime hours, both on I-95 and the Merritt Parkway, state officials have announced. Three bicycles locked with cables at Noroton Heights Railroad Station were stolen last week — one on Wednesday and the others on Friday, Darien police said. Police gave these accounts of the thefts: Wednesday: $600 Bicycle A Darien man who locked his bicycle to the bike rack at the westbound trains side of the station (the north side, nearest Heights Road) at about 4:45 a.m. on Wednesday.